The show is being held in the 18th-century Palazzo Morando, situated in Milan, near Via Montenapoleone, the upscale shopping street in town, famous for its ready-to-wear fashion and jewelry shops. 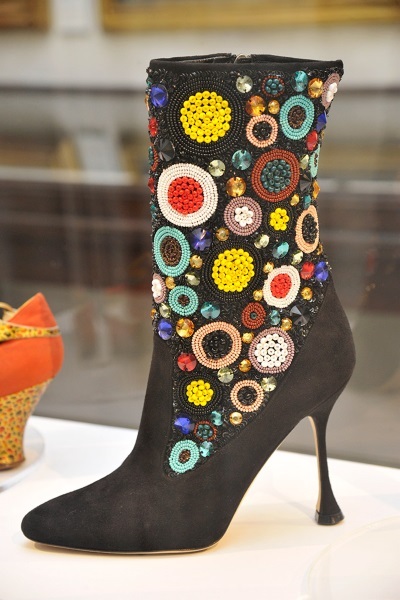 Curated by Cristina Carrillo de Albornoz, the exhibition intends to celebrate Blahnik’s work, highlighting his creativity, vision, art and craftsmanship. The exhibition is divided into six areas according to Blahnik’s inspirations. It includes the “Gala” section, displaying the most imaginative styles. Dedicated corners focusing on materials, art, architecture and the many geographical influences Blahnik had during his creative process are also part of the exhibit. The shoe designer has dedicated the show to friends Franca Sozzani, who died last Decembers, and Anna Piaggi, and Italian fashion writer and a style icon, who has been very close to Manolo, helping him when he first went to Milan. Milan is the first stop of the touring exhibition, which will then travel to St. Petersburg, Prague, and Madrid, before heading to the Bata Shoe Museum in Toronto next year.